Amazon’s wildly popular Fire TV Stick is on sale for Black Friday for just $25, but it normally retails for $40. 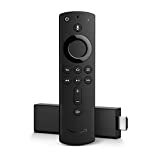 Meanwhile, the brand new Fire TV Stick 4K with all-new Alexa Voice Remote normally sells for $50, with is a killer value considering you get 4K, HDR support, Dolby Atmos support, and Amazon’s new next-gen Alexa voice remote. As you might have surmised though, the new 4K model is also on sale for Black Friday 2018, and the price is down to just $34.99. That’s $5 less than the old Fire TV Stick’s normal retail price, and you don’t have much longer to take advantage.